What is the MINA Function? 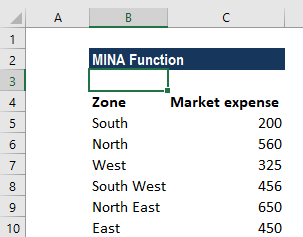 The MINA function is categorized under Statistical functionsFunctionsList of the most important Excel functions for financial analysts. This cheat sheet covers 100s of functions that are critical to know as an Excel analyst. The function will return the minimum value in a given list of arguments. From a given set of numeric values, it will return the smallest value. The MINA function compares numbers, text, and logical values as TRUE or FALSE. 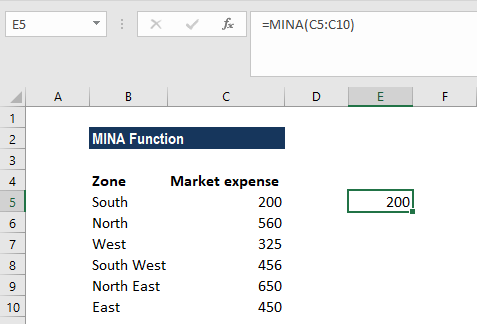 In financial analysis, MINA can be useful in extracting the minimum numeric value, ignoring the empty cells. For example, we can calculate the lowest test score, the slowest and fastest times in a race, the lowest temperature, or the smallest expense or sales figure. Value1 and Value2 are the arguments used for the MINA function, where Value1 is required and the subsequent values are optional. Arguments can be provided as constants, or as cell references or ranges. The MINA function evaluates TRUE and FALSE values as 1 and 0, respectively. 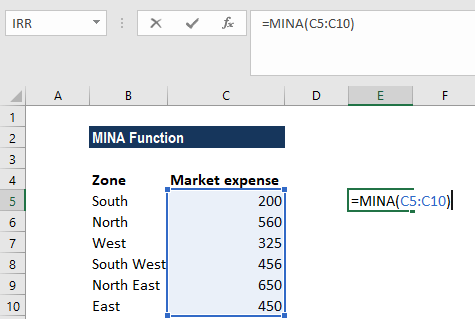 How to use the MINA Function in Excel? Let’s calculate the lowest market expense that was expensed in the given zones. 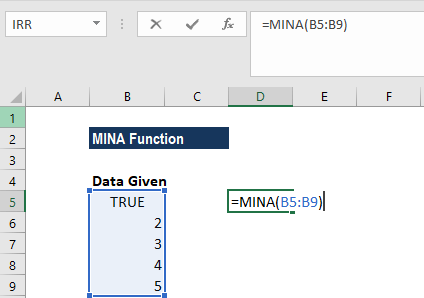 Using the MINA function, we can retrieve the smallest value from the set of values in cells B5-B9. We get 1 as the result. 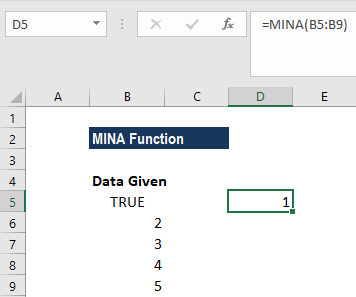 The function will treat the value TRUE in cell B5 of the spreadsheet as the numeric value 1. Therefore, it is the smallest value in the range B5-B9. #VALUE! 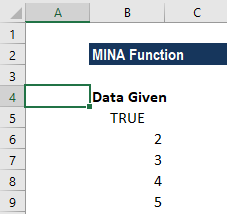 error – Occurs if any values that are supplied directly to the MINA function are non-numeric. The function evaluates TRUE and FALSE values as 1 and 0, respectively. The primary difference between MIN and MINA is that MINA evaluates TRUE and FALSE values as 1 and 0, respectively.